Tomas is a mass of disorganzied showers and storms. At this time were wondering if Tomas will actually restrengthen back to a hurricane as predicted by the hurricance center. The wind shear and dry air from a few days ago has taken a heavy toll on the structure of Tomas. It has slowed down and should turn northwest by later today. A large amount of convection is still present, so Tomas still has the chance to reorganize before moving in the general direction of Haiti. 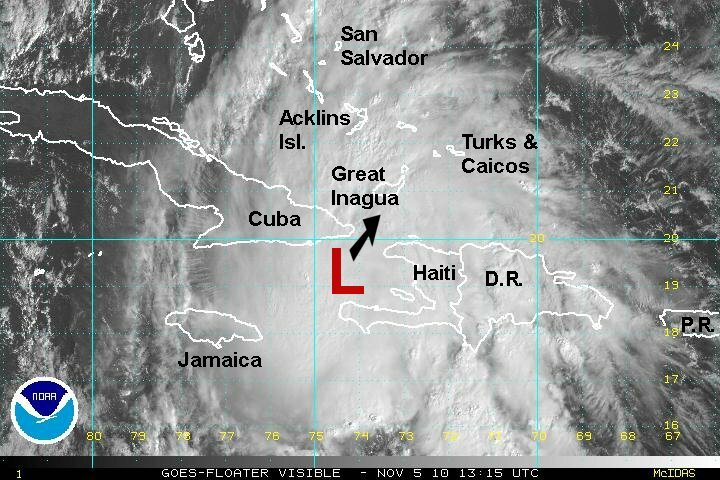 We can hope that the structure has been disrupted enough for it not to restrengthen significantly before reaching Hispaniola. The exact position of Tomas is uncertain due to the fact of the low center being elongated. The hurricane hunter had a difficult time finding a clear center. As of 7 am edt / ast Tomas was centered near 13.5° N / 75.5° W or about 410 miles south southwest of Port Au Prince, Haiti / 325 south southeast of Kingston, Jamaica. Top sustained winds are estimated at 35 mph (NHC 35 mph estimate - 5 am edt advisory). Movement - west northwest 5 mph. Pressure estimated at 1006 mb. Tomas is in the southwestern Caribbean. It is expected to slowly make a turn to the northwest, then north by later today into tomorrow. That will take it east of Jamaica and probably close to Haiti. At this time Tomas is weak but it possible that Tomas will have better conditions to restrengthen some before moving into Haiti. By late Friday or Saturday, Tomas is expected to move into the Atlantic near or east of the Turks and Caicos. It's strength will largely depend on how much of Haiti Tomas crosses. Tomas is expected to make an east northeast turn with a slow moving front after this. That will put it north of Puerto Rico by 100-200 miles later Sunday into Monday. At this time Tomas is not expected to be very strong due to effects from land and wind shear. Remember, longer range forecasts are subject to larger errors. Tomas is a yo-yo. Weaken - strengthen - weaken - strengthen. After wind shear greatly disrupted Tomas's circulation the past few days, it is now taking shape again. Banding is starting to take shape again and pressure is slowly dropping. 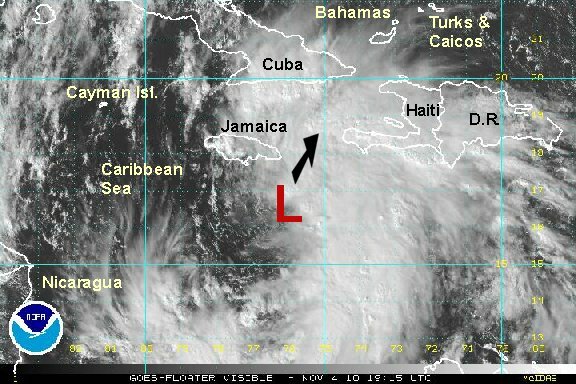 This indicates the next strengthening phase south of Haiti. A heavy rain band is currently south of the southern peninsula. As of 5 pm edt / ast Tomas was centered near 14.9° N / 74.8° W or about 305 miles south southwest of Port Au Prince, Haiti / 250 south southeast of Kingston, Jamaica. Top sustained winds are estimated at 45 mph (NHC 45 mph estimate - 5 pm edt advisory). Movement - north northwest 6 mph. Pressure estimated at 1003 mb. Tomas has been relocated today as the storm is reorganizing. It has mad a turn today more to the north. That will take it east of Jamaica and probably close to Haiti. At this time Tomas is weak but it possible that Tomas will have better conditions to restrengthen some before moving into Haiti. By late Friday or Saturday, Tomas is expected to move into the Atlantic near the Turks and Caicos. It's strength will largely depend on how much of Haiti Tomas crosses. Tomas is expected to make an east northeast turn with a slow moving front after this. That will put it north of Puerto Rico by 200-300 miles later Sunday into Monday. At this time Tomas is not expected to be very strong due to effects from land and wind shear. Tomas's path has shifted slightly west. This means that Hait will still get heavy rain, but not a direct hit. a new hurricane hunter report came in after the 5 am hurricane center advisory. It showed the wind a little lower and pressure a notch higher than the 5 am report. The hurricane center is predicting Tomas to be a hurricane as it moves through the Windward passage. So far that strengthening has not been seen, but of course is possible. As of 7 am edt / ast Tomas was centered near 15.9° N / 76.1° W or about 305 miles southwest of Port Au Prince, Haiti / 150 south southeast of Kingston, Jamaica. Top sustained winds are estimated at 45 mph (NHC 50 mph estimate - 5 am edt advisory). Movement - north northwest 7 mph. Pressure estimated at 998 mb. Tomas's forecast has changed a litlle. It is about 12 hours ahead of schedule and a little farther west by about 50 miles. Because of this Tomas will be near the eastern tip of Jamaica / southwestern tip of Haiti or just offshore late this afternoon. It will move through the Windward passage tonight into early Friday and be over the southeastern Bahamas and Turk and Caicos Friday afternoon. It will continue north in the open water northeast of the Bahamas along a front Saturday into Sunday where it predicted to gradually weaken into early next week. If Tomas does move through the Windward passage, it may have the chance to reach hurricane strength before reaching the Turks and Caicos / southeastern Bahamas by tomorrow. So far, significant strengthening has not been seen. 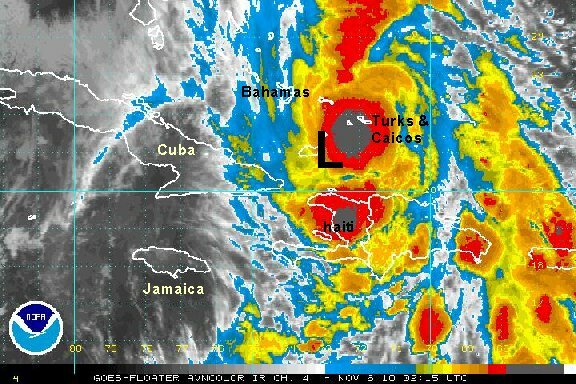 Interests in the southern Bahamas, Turks and Caicos, eastern Cuba, Jamaica, and Haiti should follow Tomas closely. A large area of heavy showers and storms has started to move into Haiti as Tomas heads toward the Windward Passage. 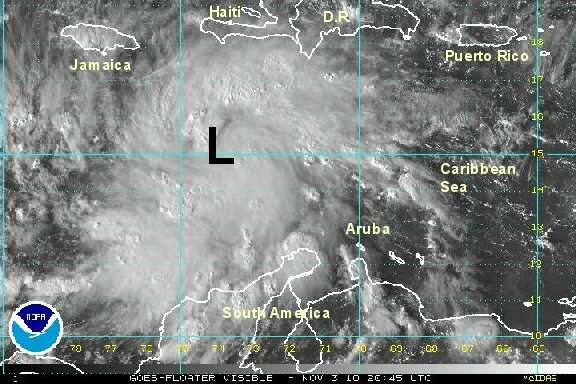 It is a lop-sided tropical cyclone with most of the unsettled weather on the eastern half of the circulation. 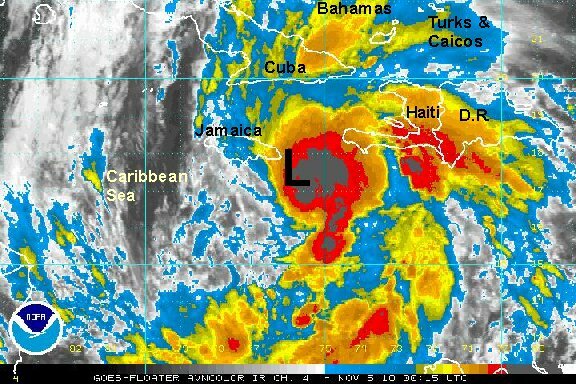 That will take the heaviest rain into Haiti and southern Cuba. Rain / wind will pick up in the dominican Republic / Turks and Caicos / southern Bahamas overnight tonight into Friday. Several inches of rainfall is likely in the path of Tomas with flash flooding. The mountainous locations of Haiti will be particularly vulnerable with orographic lifting adding to the rainfall intensity. 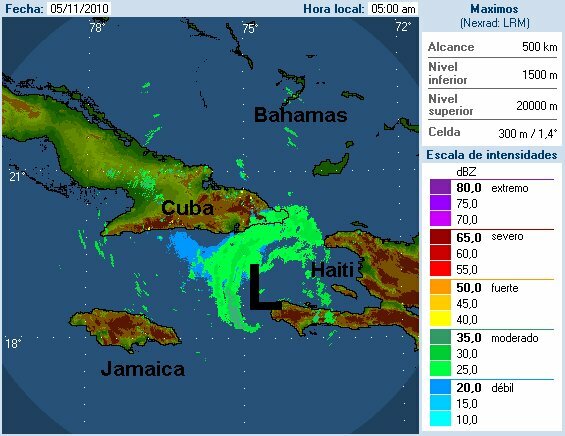 More than 10 inches is possible in Haiti, especially in the mountians. As of 5 pm edt / ast Tomas was centered near 16.6° N / 76.0° W or about 280 miles west southwest of Port Au Prince, Haiti / 110 south southeast of Kingston, Jamaica. Top sustained winds are estimated at 50 mph (NHC 50 mph estimate - 5 pm edt advisory). Movement - north 5 mph. Pressure estimated at 995 mb. Tomas will pass just east of eastern Jamaica late this evening and just west of Haiti overnight tonight as it heads through the Windward passage. It will likely make a brief landfall of the southeastern coast of Cuba Friday morning before crossing into the southeastern Bahamas and Turk and Caicos Friday afternoon. It will continue north in the open water northeast of the Bahamas along a front Saturday into Sunday where it predicted to gradually weaken into early next week. Tomas may have the chance to reach hurricane strength before reaching the Turks and Caicos / southeastern Bahamas by tomorrow morning / afternoon. Satellite imagery has showed cloud top cooling tonight, indicating strengthening. It will likely achieve hurricane strength as it moves through the Windward passage and possibly retain that strength through the southern Bahamas tomorrow. As of 10 pm edt / ast Tomas was centered near 17.1° N / 75.8° W or about 250 miles west southwest of Port Au Prince, Haiti / 85 miles east southeast of Kingston, Jamaica. Top sustained winds are estimated at 60 mph (NHC 60 mph estimate - 8 pm edt advisory). Movement - north northeast 8 mph. Pressure estimated at 993 mb. Tomas will pass though the Windward passage tonight and Friday morning. 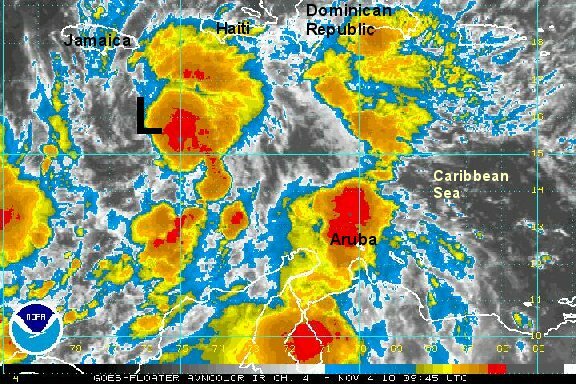 It will just east of Jamaica and near or just west of the southwestern peninsula of Haiti. It will likely make a brief landfall of the southeastern coast of Cuba Friday around midday before crossing into the southeastern Bahamas and Turk and Caicos Friday afternoon. It will continue north in the open water northeast of the Bahamas along a front Saturday into Sunday where it predicted to gradually weaken into early next week. Tomas has a good chance to reach hurricane strength before reaching the Turks and Caicos / southeastern Bahamas by tomorrow morning / afternoon. A recent hurricane hunter recon at 6 am edt has found that Tomas has winds of at least 85 mph. A flight level wind to 100 mph was also found, but the pressure has gone up a little. Tomas has slowed and will be moving just west of Haiti this morning before heading toward the southern Bahamas and Turks & Caicos. With Tomas remaining over the Windward passage additional strengthening is possible today. As of 7 am edt / ast Tomas was centered near 18.3° N / 74.7° W or about 155 miles west of Port Au Prince, Haiti / 350 miles southwest of the Turks and Caicos. Top sustained winds are estimated at 85 mph (NHC 80 mph estimate - 5 am edt advisory). Movement - northeast 9 mph. Pressure estimated at 987 mb. Tomas is a little behind schedule on its track. It will still be moving through the Windward Passage for the rest of this morning. It will head into the southeastern Bahamas and Turk and Caicos this afternoon into this evening. It will continue north in the open water northeast of the Bahamas along a front Saturday into Sunday where it predicted to gradually weaken into early next week. 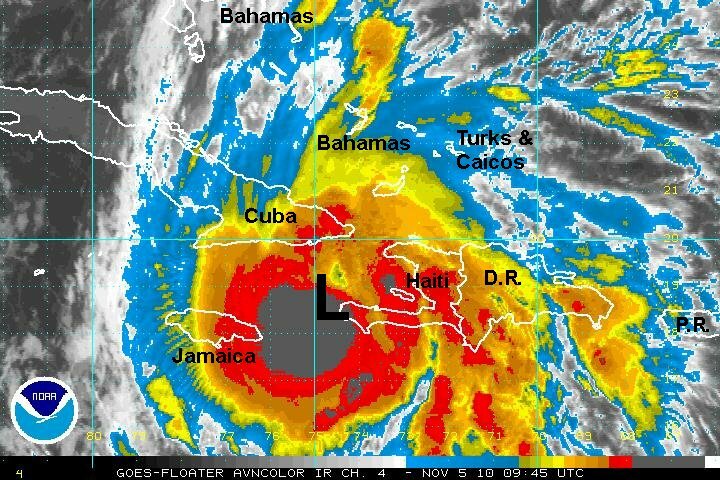 Interests in the southern Bahamas, Turks and Caicos, eastern Cuba, western Dominican Republic, Jamaica, and Haiti should follow Tomas closely. Latest satellite imagery shows a little cloud top warming. The most recent recon also found winds a little lower and pressure a notch higher. Because of this we're lowering winds a touch. Interaction with land could also be a factor in the slight weakening trend. As of 10 am edt / ast Tomas was centered near 19.0° N / 74.5° W or 150 miles south southwest of Great Inagua, Bahamas. Top sustained winds are estimated at 80 mph (NHC 85 mph estimate - 8 am edt advisory). Movement - northeast 10 mph. Pressure estimated at 988 mb. Tomas is in the Windward Passage. 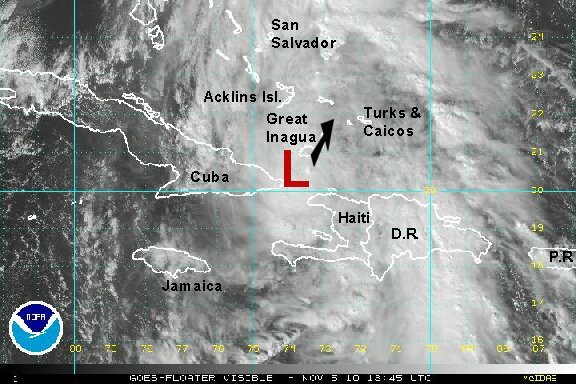 It will head into the southeastern Bahamas and Turk and Caicos this afternoon into this evening. It will continue north in the open water northeast of the Bahamas along a front Saturday into Sunday where it is predicted to gradually weaken into early next week. Tomas is just southeast of the eastern tip of Cuba. Recent satellite images show that Tomas has weakened a little more. Top sustained winds are probably near 70 mph. This is due to the interaction with eastern Cuba. A complete update will be posted later this afternoon. Tomas is considerably weaker this afternoon. A recent recon showed surface winds of 55 mph and flight level winds to 75 mph. We believe that NHC will keep Tomas a hurricane at 75 mph for the sake of continuity. They also tend to favor near flight level winds. We believe that with a pressure of 992 mb that 60 mph is a reasonable estimate. As of 4 pm edt / ast Tomas was centered near 20.2° N / 73.9° W or 60 miles southwest of Great Inagua, Bahamas. Top sustained winds are estimated at 60 mph (NHC 85 mph estimate - 2 pm edt advisory). Movement - northeast 10 mph. Pressure estimated at 992 mb. Tomas will be heading through the southeastern Bahamas tonight. It will continue northeast into the open water of the Atlantic, northeast of the southern Bahamas along a front Saturday into Sunday where it is predicted to gradually weaken into early next week. 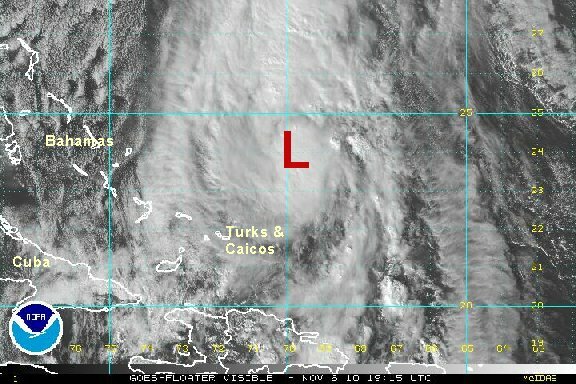 Interests in the southern Bahamas, Turks and Caicos, should continue to follow Tomas. As we thought....nhc left tomas as a minimal hurricane at 5 pm edt. Tomas has had a bit of a convective burst, but it is to the northeast of the center of circulation. The circulation itself has been sheared. We do not think that Tomas is a hurricane at all. A pressure of 994 mb is not close to being categorized as a hurricane. 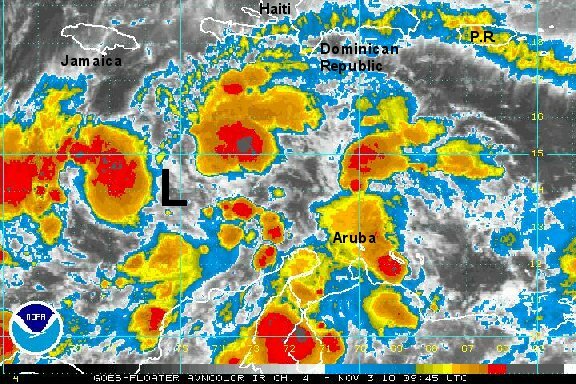 The heaviest rain and gustiest winds appear to be over the Turks and Caicos. As of 11 pm edt / ast Tomas was centered near 20.8° N / 72.8° W or 35 miles southeast of Great Inagua, Bahamas. Top sustained winds are estimated at 60 mph (NHC 75 mph estimate - 11 pm edt advisory). Movement - northeast 13 mph. Pressure estimated at 994 mb. Tomas is heading through the southeastern Bahamas tonight. It will continue northeast into the open water of the Atlantic, northeast of the southern Bahamas along a front Saturday into Sunday where it is predicted to gradually weaken into early next week. The hurricane center finally downgraded Tomas to a tropical storm. They waited until it had passed the Islands. With a pressure of 992 mb - which is still a high pressure for a strong tropical storm - we're once again estimating lower. If a tropical storm has 70 mph winds sustained, we should be finding gusts to at least 80 mph. I don't believe that's happening. 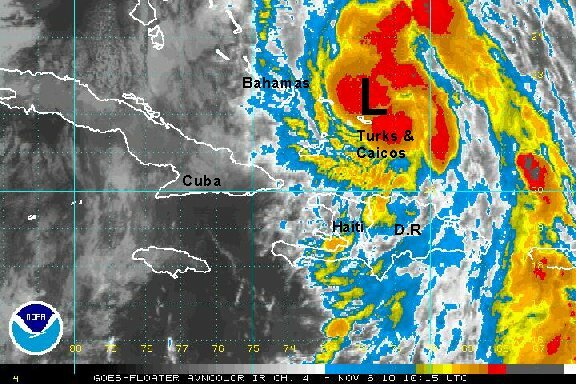 The heaviest rains and gustiest winds have been on the Turks and Caicos. There are no official reports from those islands unfortunately. Tomas is on it track away from the area today. As of 7 am edt / ast Tomas was centered near 22.0° N / 71.3° W or about 40 miles north of Grand Turk. Top sustained winds are estimated at 55 mph (NHC 70 mph estimate - 5 am edt advisory). Movement - northeast 15 mph. Pressure estimated at 992 b.
Tomas will continue to pull away from the Turks and Caicos and southern Bahamas today. It will continue northeast into the open water of the Atlantic into early next week as it weakens. 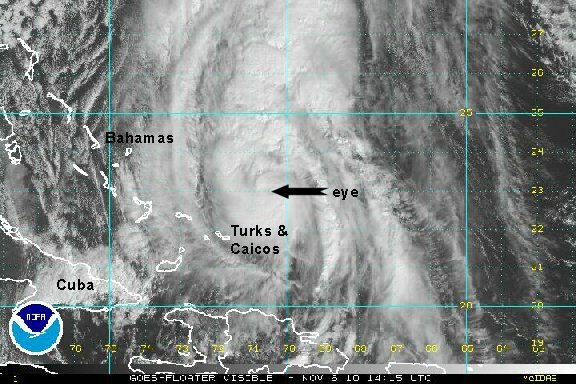 The latest visible Satellite imagery shows that an eyewall is reorganizing as Tomas pulls away from Turks and Caicos. A recent hurricane hunter recon found the pressure about the same but stronger surface winds. Because of this we are increasing winds on our estimate. It is interesting to note that NHC has lowered their winds at 11 am edt ....now we match with our windspeed estimate of 65 mph! Most of the effects are moving away from the Turks and Caicos and southern Bahamas, but a rain band still could develop over the area. As of 11 am edt / ast Tomas was centered near 23.1° N / 70.6° W or about 115 miles northeast Grand Turk. Top sustained winds are estimated at 65 mph (NHC 65 mph estimate - 11 am edt advisory). Movement - northeast 16 mph. Pressure estimated at 991 mb. Cloud tops have not cooled this afternoon. After some additional organization late this morning, Tomas has probably lost a little steam. Tomas moved very close to a buoy evidenced by winds switching from south to north. Seas are now 15 feet not far from the low center. 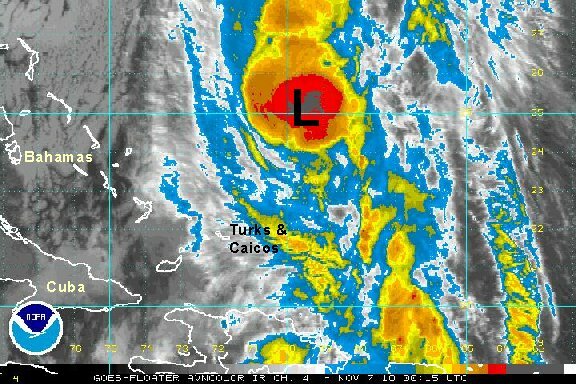 Effects of Tomas are quickly moving away from the southern Bahamas and Turks and Caicos. As of 4 pm edt / ast Tomas was centered near 23.7° N / 70.0° W or about 210 miles northeast Grand Turk. Top sustained winds are estimated at 55 mph (NHC 65 mph estimate - 11 am edt advisory). Movement - northeast 16 mph. Pressure estimated at 994 mb. Tomas has gone through cycles of weakening and strengthening since in the Windward passage. Cloud tops have cooled significantly and pressure has dropped significantly as well....again. A hurricane hunter found a surface wind of 63 knots / 73 mph or just under hurricane strength. Once again, NHC made their wind estimate based on the flight level wind which is higher. As of 9 pm edt / ast Tomas was centered near 25.1° N / 69.6° W or about 275 miles north northeast of Grand Turk. Top sustained winds are estimated at 75 mph (NHC 80 mph estimate - 11 am edt advisory). Movement - north northeast 15 mph. Pressure estimated at 986 mb. Tomas will continue northeast into the open water of the Atlantic into early next week as it weakens.